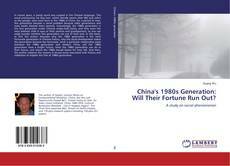 Buchcover von China's 1980s Generation: Will Their Fortune Run Out? In recent years, a newly word was created in the Chinese language. This word pronounces 'ba ling huo', which literally means after 80s and refers to the people, who were born in the 1980s in China. For a period of time, this generation became a social problem because older generations and mass media blamed them severely. Interestingly, the 1980s generation is the first generation under Chinese single-child policy, and they were the most beloved child in eyes of their parents and grandparents, so one can easily wonder whether this generation ran out of their luck. In this book, at first the author discusses why the 1980s generation is the most fortunate generation in Chinese history, why the social development makes this generation become less fortunate, what a particular relationship exists between the 1980s generation and modern China, will the 1980s generation have a bright future, what the 1980s generation can do in their future, and whom the 1980s should blame for their fall. And then, the author explores the reasons in broad sense associated with history and civilization to explain the fate of 1980s generation.